Eleanor West collects children who have slipped through the cracks and come back changed, reaching out to parents who no longer know their children, offering to help their lost boys and girls. A boarding school asylum for children seemingly driven insane by unknown trauma. The children who Eleanor gathers aren't crazy, they've slipped through doorways open only to them and into other worlds. Worlds where their experiences changed and shaped them, worlds with monsters and magic, worlds where the rules of reality differ strongly from our own. The school is an asylum not for damaged children, but a shelter from a world unable to understand them while teaching the students how to fit in until they find their door again. The school may be the safest place for these changelings, but darkness lurks with an agenda of its own. Excellent read, one that will appeal to both teen and adult readers without pandering to either audience. 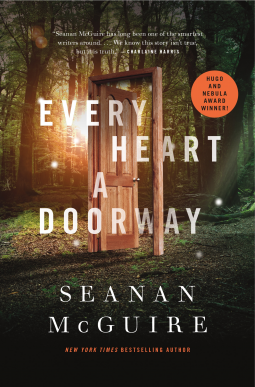 McGuire handles dark themes adroitly, giving us just enough to paint the scene while avoiding a descent into horror. She skirts a love triangle, but gives us a lead who is asexual, and one "suitor" who is in love with his skeleton-girl and another who was locked out of his doorway when they discovered their princess was actually a prince. The story reminds me so much of Changeling: The Lost, but with a focus on changelings who want to return to Arcadia and the Gentry. If that makes sense and appeals to you, I strongly recommend this book.